We wanted to let you all know about some exciting news! We have decided that it is time for us to move on from Agritopia and farm somewhere new. Originally, we told the Johnston’s back in December of our decision to leave but took the last few months to see if there was a way to make things work. It has been a good 5 years but we've concluded that it just isn’t a good fit anymore and ultimately isn’t where we want to be long term. Our lease will expire on 6/30/16 but we will be farming as usual until then. You all are the reason we farm and we couldn't do it without you! You have been on our minds as we have worked through this process. We plan to continue to farm in this area but are still working to finalize a new location. We would be extremely grateful if you would keep us in your thoughts as we decide on a location. As soon as we have more information, we will let you know. Please let us know if you have any questions. Thank you! The peaches are ripening up nicely and we plan to open for U-Pick Saturday May 7th. Hours will be 8am-2pm. The cost is $2.50 per pound. Make sure to bring your cameras so you can take advantage of the beautiful setting and take some pictures of the family. It's been a great year for our Allium (onion family) crops, garlic included! We have started field curing the garlic and onions and be moving them shortly to our greenhouse to finish the curing process. What is curing and why do we do it? Curing onions and garlic is basically allowing them to dry up on the outside creating a barrier of skin that keeps the middle fresh. This allows you to keep onions and garlic in our pantry for long periods of time without them spoiling. 3. Cut up the sweet potato, zucchinis, beets, and red bell pepper into bite-sized pieces. Spray a baking sheet with non-stick spray and lay out veggies. Drizzle veggies with olive oil and season with sea salt and black pepper. 4. Place in oven and roast for about 20-30 minutes, checking every ten minutes and stirring. 5. In a pot of water, bring to a boil and boil egg for about 7-8 minutes. 6. Once the quinoa, veggies, and egg have cooked, gathering your serving bowls (2-3 depending on who you’re serving). Place in a scoop of quinoa, a handful of veggies, and a slice of the boiled egg. Top with a few leaves of kale, 1/4 cup of the red cabbage, and 1/4 cup off the radish shoots. 7. Enjoy!! Serve with your favorite dressing or with a dollop of hummus or Greek yogurt. 8. Store leftovers in the fridge for about 1 week in a sealed container. Spring/Summer CSA Week 8: fennel, red romaine lettuce, yellow sweet onions, redbor kale, chioggia beets, radish shoots, italian flat leaf parsley, ponderosa lemon. 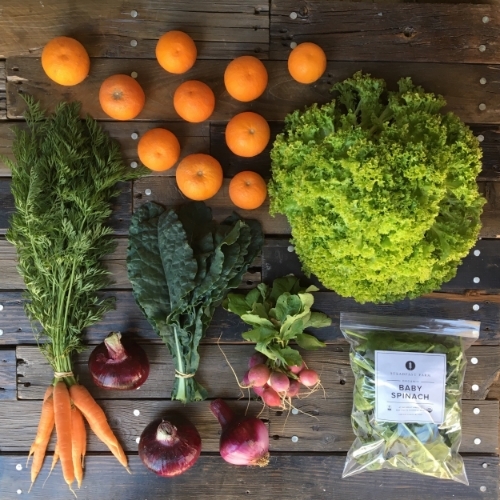 Spring/Summer CSA Week 9: red beets, spring lettuce mix, hakurei turnips, ripbor kale, fresh garlic, white sonora wheat berries, oro blanco grapefruit. Spring/Summer CSA Week 10: bolero carrots, black tuscan kale, baby spinach, easter egg radishes, mixed head lettuce, red onions, blood oranges.